Have you played in the CAS Christmas Card Challenge yet? just one week left to join in! Susan has been our hostess this month and she chose "Snowman" as the theme. Well it appears that I am lacking in the snowman stamp area as well as ornaments from last month. With a 12x14 box bursting with Christmas/Winter stamps. How am I lacking? LOL However, I did find I have several digital images of snowmen and so pulled out one of them. I haven't used digital stamps in ages it seems and I do like these marshmallow snowmen images from Bugaboo Stamps I have. I printed the image on watercolor paper and colored it with my Zigs. I went for non-traditional colors. I did use a clear Wink of Stella to add some sparkle to the snowman and snowflakes. I originally had planned to make a shaker card using the stitched dome die, but after cutting all the layersI just liked it better without the acetate on top. So, I made a "glass-less" globe instead. After putting it together, I thought my globe reminded me of those little plastic souevnir snowglobes we could get as a kid from practically every souvenir shop across the country. I did think my background needed a little pizzazz so I used a stencil of small circles and made snowfall using Whipped spackle and Wonderlust glitter. When that was dry I added some Wink of Stella to each one as well. Today the whole team has new snowmen projects to share as a reminder the challenge is still going on. 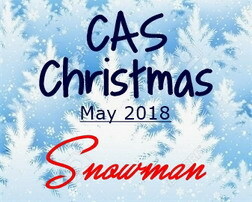 Be sure and check them out too at the CAS Christmas Challenge Blog. Then, dust off those Frosty snowman stamps, ink up and join us. Just make sure to make it CAS (clean and simple). You have until May 24th to join us! 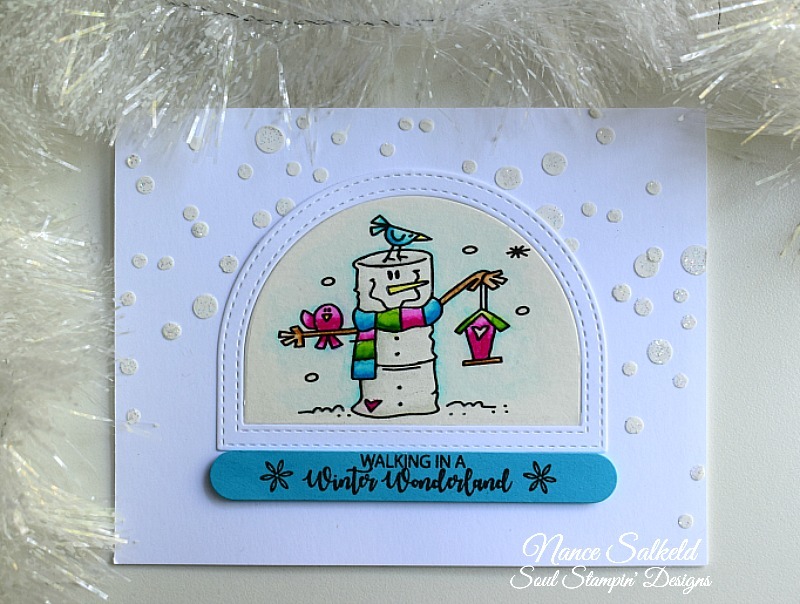 STAMPS: Snowman (Bugaboo Stamps). Sentiment from Winter Woodland Set (Catherine Poole). PAPER: White cardstock (Neenah Solar White 110 lb); Watercolor paper (Strathmore); turquoise - Stash. EXTRAS: Stitched dome die (My Favorite Things); sentiment frame die (My Favorite things), Clear Wink of Stella; Whipped Spackle (Faber Castelle); Wonderlust (Wow); Turquoise/medium blue craft foam from Michaels. Your marshmallow snowman is so cute and I love how you added so much fabulous coloring with your Zig markers, Nance! This is such a darling design! Love this marshmallow snowman, Nance! These colors are so festive and fun and so is that sparkly snow! Such a fun Christmas card!